Through a series of coincidences, I got invited to draw the cover for this year’s SPX program. Seeing that Harvey Pekar will be a special guest at this year’s show, SPX Executive Director Steve Conley thought a Pekar theme would be appropriate. I talked it over with Harvey, and he suggested showing himself at the show, with me, man_size, and Ed Piskor, all artists of his who will also be in attendance. 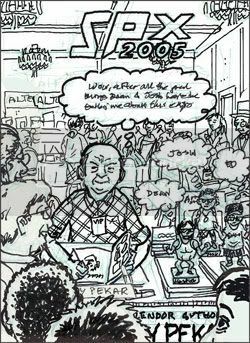 Harv is saying, “Wow, after all the great things Dean and Josh have been tellin’ me about this expo, and now I’m here finally — as a guest with his own booth no less.” Pekar also suggested having me, man_size, and Piskor coming up with our own lines of dialogue. Thus, my sketch showed a line of eager fans in front of Harvey at his booth as he signs copies of his books, DVDs, etc. Behind him we see other exhibitors, fans, cartoonists, etc, in the Versailles Room. Showing the American Splendor artists (me, man_size, & Piskor) didn’t seem as important, and took away from the other two important elements above. I left space for each of us bobbleheads to have a line of thought- balloon dialogue, but personally I thought that took away from the concept. Having the dolls talking was just a little too symbolic and surreal. After talking it over with Steve and man_size we decided to keep the bobbleheads mum, so I was happy to scrap that. Neither man_size nor Ed had come up with lines of dialogue anyway! So there you have it. I finished drawing the actual cover yesterday and am coloring it today. There are a lot of people in the background scenes — see if you recognize any familiar faces. Am I the fat, sweaty guy on the right? Ha! Thats funny – i was just kidding around. I’ll have to check it out on the large piece. wait…why is Dean wearing a shirt? Any option w/out chest hair is “safer” for the community at large. Nice Sari! And I’d recognize Jason’s hat anywhere. btw, his wife has a gig coming up…you ever hear her play? Kudos overall – thattsa nice piece! I definitely see Jason Little. Is that your wife standing next to him? Is the sweaty guy on the right (that Neil thought was him) Tony Consiglio? I thought that was me and Radtke, but didn’t want to be egotistical and assume so. Is that Alex next to Tony also? nah, i knew it wasnt me. i’m not sweaty. Awesome cover! I like playing “Who’s Waldo” with the artists who I kinda know… which is only Jason because of his hat. You have to tell me which one Neil is. Neither [Dean] nor Ed had come up lines of dialogue anyway! Which implies to me that you’d already thought up yours. What would your doll have said? see above to identify neil. i was trying to get into the harvey p. spirit. maybe one of the people in the extreme foreground? looks like a gal but is really a guy? Is that Nick B. behind Harvey’s head? And Gary Groth behind Alex? And who’s the babe at right that’s got “Mr. Doublecross” all sweaty? hmmm, wasn’t supposed to be groth, but let’s just say it is!